Football season is finally here! 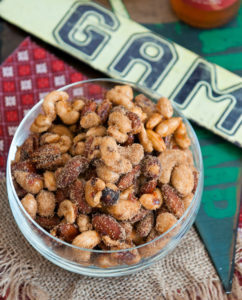 Whether you’re tailgating or gathered around a TV, that means it’s time to get your game on! But you don’t want to spend your time in the kitchen, so we’ve got 5 quick and simple recipes for you. Let our sweet and spicy pepper jellies add just the right amount of flavor to your game day favorites. 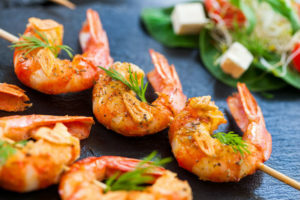 Peaches and habaneros pair with pork ribs, jalapeno, garlic and lime with grilled shrimp, smoky beef with jalapeno, habanero and red peppers….and even grilled peaches and goat cheese with peach habanero glaze for dessert! 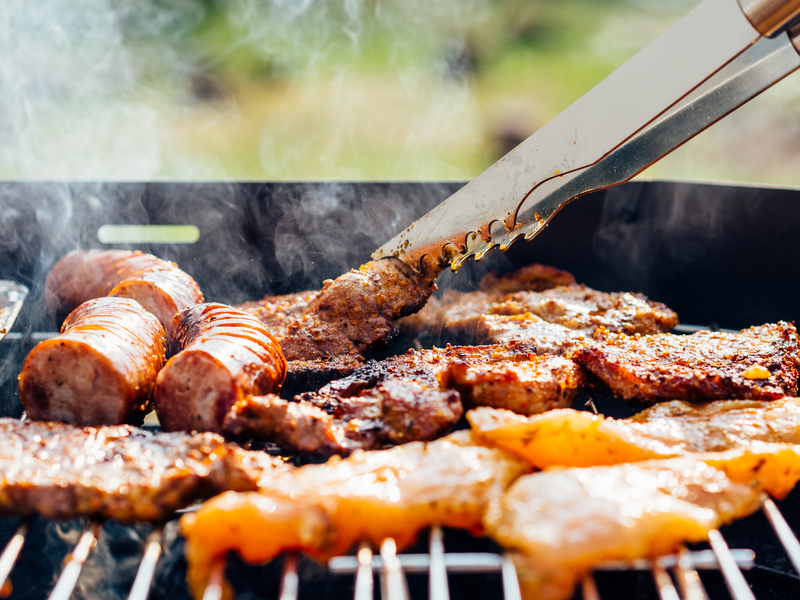 Get your grill turned on because these take NO time! This simple recipe will take your Teriyaki chicken wings to the next level with your favorite flavor of Mrs. G’s hot pepper jelly. 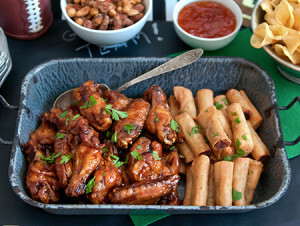 Perfect to prepare quickly for game day at the TV or to pack up for a tasty tailgate outing. At our house, we have to add some freshly made lumpia or spring rolls, too! Move over industrial sweet and sour sauce, make way for our fresh pepper jellies! Just dip or drizzle with your favorite. Don’t forget the dessert! Want to impress your friends with a gourmet dessert that couldn’t get any easier? 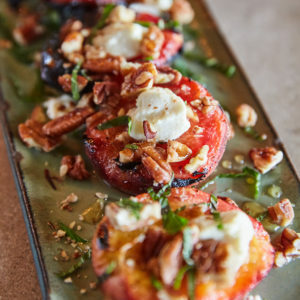 Grilled peaches with goat cheese and pecans, adapted from a recipe by Chef Rob McDaniel at Spring House Restaurant is our choice. Grilling the peaches brings out a luscious carmelization that pairs so well with the earthy creaminess of the goat cheese and crunchy pecans. Brush some of our Peach Habanero jelly on them for the last moments of cooking. Drooling yet? Mrs. G’s sweet and spicy Ja-Ha jelly combines perfectly with one of my go-to rubs from my friend Nydia at The Spanish Tin. 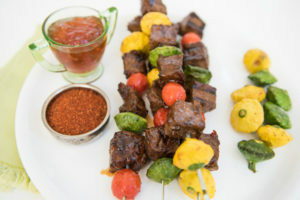 Her Smoky Spanish BBQ Rub is just the right amount of earthy, smoky rich flavor added to our spicy sweet jalapeno-habanero-red bell pepper jelly in this delicious glaze for tender steak skewers. The perfect combination! These smoky-sweet skewers are quick and easy enough to get on the weeknight dinner table, “fancy-pants” enough to serve to company. And they will think you spent much more time on it! Your welcome! 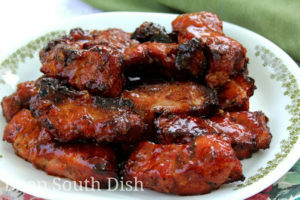 Mary at Deep South Dish paired our Peach Habanero pepper jelly with some country style ribs OH MY! Those southern chefs love their peaches and pork — try it and transport yourself to a warm summer evening on a wraparound porch in Georgia, sipping sweet tea with a plate full of these mouth-watering ribs! Mary’s cooking reminds me of my southern mama and the dishes I was raised on! Check out her cookbooks and all of her recipes! She is the real deal southern cook.